Go with BlackMax when the look of solid black is what you want. It features heavy-duty, rich black, anodized rails and bows--a sharp look even when the cover is rolled up. Quick-release lever disengages tail rail for fast bulk hauling. To secure, simply "click" back into place. Made of heavy-duty fiberglass and reinforced nylon composite. Fiberglass-reinforced nylon snaps that will not break or scratch rails. Patented BlackMax 4-way snaps feature a tension tab to prevent sliding. 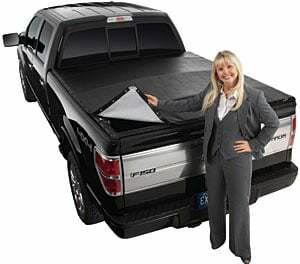 Exclusive to BlackMax, snaps along the cab rail allow quick, easy loading at the front of the truck bed. Does Extang 2785 fit your vehicle?